The sign came on the same day that a bill went into effect making California a sanctuary state. “OMG! 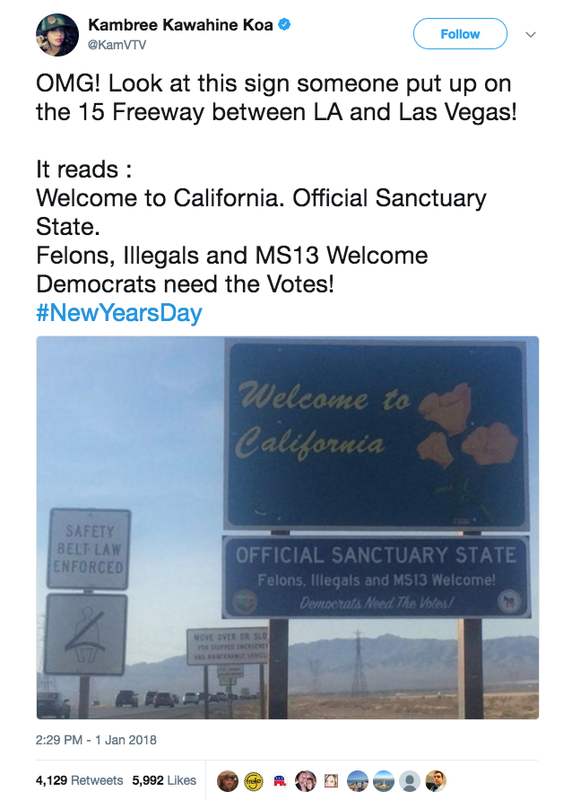 Look at this sign someone put up on the 15 Freeway between LA and Las Vegas,” political news contributor Kambree Kawahine Koa wrote on Twitter. It is unclear who posted the prank signs that were greeted by drivers as they entered California from Arizona and Nevada on Highway 95. Much national debate has erupted over sanctuary cities. A sanctuary city is a city that bars its cooperation with the national government where it involves immigration laws. In such cities, federal police can’t always rely on local authorities to uphold immigration laws. The prank signs came at the same time California became a “sanctuary state” after a bill that was signed in October went into effect Monday. The new law bars people from asking someone about their immigration status or participation in federal immigration enforcement activities, Fox News reported. California has approximately 2.3 million illegal immigrants. The bill was passed at the same time the Trump Administration threatened to crack down on sanctuary cities. “These are uncertain times for undocumented Californians and their families, and this bill strikes a balance that will protect public safety, while bringing a measure of comfort to those families who are now living in fear everyday,” Gov. Jerry Brown said when he signed the bill. “The bill risks the safety of good law enforcement officers and the safety of the neighborhoods that need their protection the most,” Attorney General Jeff Sessions said last year, according to the Los Angeles Times. In April, 2017, a similar sign was posted in Malibu after the city declared themselves a sanctuary city. “Official Sanctuary City ‘Cheap Nannies and Gardeners Make Malibu Great!’ (Boyle Heights Not So Much),” the sign read, according to FOX5.